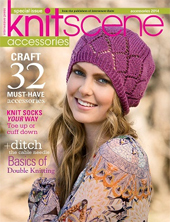 Knit the lacy Calamus Hat as seen on the cover of the Knitscene Accessories 2014 special issue with this knitting kit. Knit the lacy hat seen on the cover of the Knitscene Accessories 2014 special issue with this knitting kit. You get the entire special issue print magazine and two balls of Filatura di Crosa Zarina Chiné yarn. With 32 eye-popping designs, Knitscene Accessories 2014 delivers inspiration to knitters of all skill levels and interests. Knitscene Accessories 2014 includes Informative articles on double-knitting, cabling without a cable needle, and converting sock patterns to toe up or cuff down. Plus, enjoy patterns for accessories of all kinds, including four exclusive patterns from featured designer Carina Spencer. Plus, get to knot designer Carina Spencer with four cozy accessories full of plush texture, knit four lacy and lightweight accessories for every day, and enjoy five knits that are reversible and customizable for your closet. 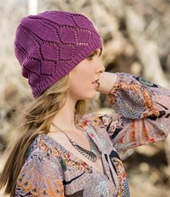 Calamus is a lacy and light slouchy hat, inspired by the layers of bird wings. Knit with this a soft, springy yarn, and the delicacy of the bird's feathers come to life in your knitting. This hat can be knit up to a 22 inch circumference and 10.5 inches tall. 2 balls of Filatura di Crosa Zarina Chiné yarn in #1671 Cyclamen, as seen on the cover of the Knitscene Accessories 2014 magazine. This 100% extrafine merino wool yarn is lightweight and washable, now available in overdyed shades. 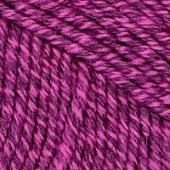 Each ball of Filatura di Crosa's Zarina Chine yarn has 181 yards of yarn. 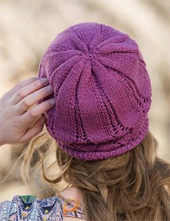 2 balls is enough to knit the Calamus Hat as seen in Knitscene Accessories 2014. *color may vary slightly from what is seen here. in Cyclamen, while supplies last.